Why is social media important to our business? Because today, a brand doesn’t exist if it’s not represented online across all social channels and regularly interacting with its followers. Social media can help not only build our brand, but also build and enhance our client, employee, and community relationships, and establish credibility through information sharing. At Janney, there are two team members in Marketing and Corporate Communications who are tasked with overseeing social media for the firm and its Financial Advisors (FAs). Julia Fellerhoff, Social Media Lead, uses data and analytics to create firm-wide social media strategies and determines what type of content should be shared, while Stefanie Lauff, Marketing Services Consultant, helps tailor that content to individual branches, advisors, teams, and their businesses to create strategies based on their respective goals. Julia and Stefanie have worked hard to ensure that Janney has a strong social presence - and the results that they’ve driven have been impressive. Through Janney’s corporate social media presence, Julia has created a one-stop shop for Janney news, sharing information about employees, community engagement, publicity, and thought leader commentary and insights. “Social media is about building relationships,” said Julia. “It is a way to showcase our brand, build loyalty, and stay relevant in the online community.” Her efforts have increased engagement on Janney’s corporate social media sites by highlighting the human aspects of the firm. Julia has also shared Janney’s social media expertise by representing the firm as a panel member at SIFMA’s Social Media and Digital Marketing Seminar in 2016, where she spoke about how Janney uses data-driven strategies and training to aid FAs in their digital marketing efforts. Stefanie Lauff has worked closely with the Private Client Group to successfully onboard hundreds of FAs to Hearsay, our compliant software partner, since joining Marketing Services in 2015. 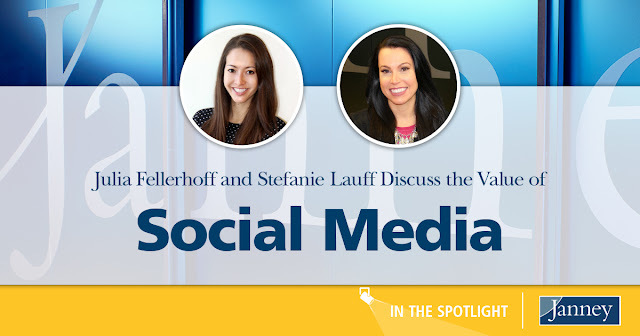 To date, Stefanie has set-up more than 600 users on LinkedIn, Facebook and Twitter, which have resulted in over 210,000 online connections and has helped Janney expand its online presence. Stefanie is also the driving force behind Janney’s social media education. To date, she has hosted more than 50 company-wide training sessions to provide users with an effective overview of how to use social media and explain the value that it offers. She has educated nearly 450 FAs on social media best practices and how to individually implement these strategies. Stefanie has represented Janney at SIFMA’s Women’s Leadership Forum as well as various Hearsay Roundtable Conferences where she serves as an advocate for Janney to create system updates and enhancements that benefit our firm.